It has been said that the Great Depression was the best thing that ever happened to American artists. A new exhibition at the Art Institute of Chicago looks at how artists of the 1930s applied their diverse visions to the American dream during this time of immense change. And whether the artists were influenced by movies or other artists, or looking back to a bygone era or ahead to the future, American art changed in the ‘30s and would never be the same. Phil Ponce: Scenes of fertile American landscapes share the gallery space with odes to industry. Examples of social realism hang beside portraits of a country at a crossroads. Judith Barter, Art Institute of Chicago: It’s sort of a Biblical title in a way, isn’t it? “After the Fall” usually means the expulsion from the Garden of Eden, and I think many people felt that is exactly what happened in the 1930s. America was founded as the “shining city on the hill” and had a tremendous amount of self-confidence right up until the time that this crash happened in 1929. There was tremendous turbulence in this country, and I really think that the ‘30s both aesthetically and politically was the most important decade of the 20th century. It was a sea change in American culture. The overriding concept of what artist were doing in the 1930s was looking for American-ness, they were inward-turned and trying to find what it was about this culture in this country that was truly American, and it took many forms. It took social realism, it took abstraction from many who had studied in Europe and came back and wanted to use their abstract expression on American subjects. It took the role of history painting. Many of Grant Wood’s history paintings are tongue-in-cheek, but they’re about American myths like the Parson Weems fable of the cutting down of the cherry tree, and some of them painted dystopic subjects. Grant Wood also painted “Death on Ridge Road,” which is about an oncoming automobile accident. Peter Blume painted Mussolini’s head coming out of a jack-in-the-box. Other people painted just the times, the street scenes, what was going on. Edward Hopper painted the interior of a movie house; Reginald Marsh painted people on the street going into the movie house, paying for their tickets. Paul Cadmus, a great painter, who painted something called “The Fleet’s In,” showing sailors coming ashore and being propositioned. So it’s everything. Ponce: Some artists of the 1930s were motivated by social outrage. Barter: Ben Shahn’s pictures of Sacco and Vanzetti for example, in their coffins, two innocent men that were executed simply because they were Italian immigrants. And lynching pictures: Joe Jones documented lynchings in the early ‘30s. The Communist Party actually called for artists to paint the subject in order to call for justice, to put this in front of the public and not let it go away. 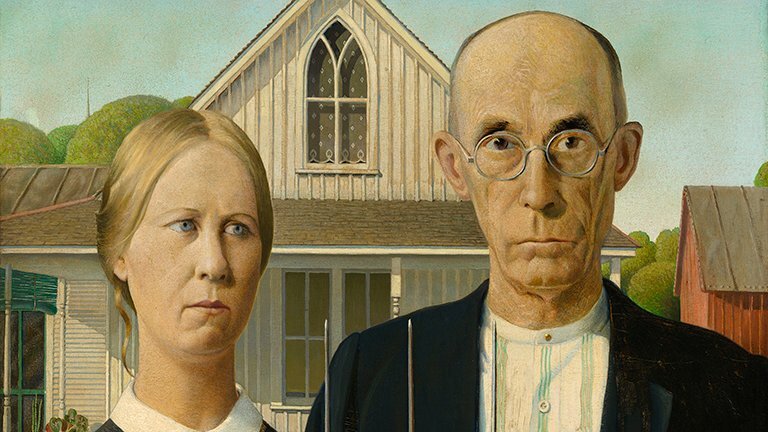 Ponce: Perhaps the most famous painting in the exhibition – Grant Wood’s “American Gothic” – will leave the North American continent for its first-ever overseas visit when the show travels in the fall. Barter: Sending the show to Europe, to both Paris and London, is a great opportunity because it will be the first time that Europeans have seen a great deal of American art, and these are, by and large – with the exception of Hopper and O’Keeffe – unknown painters to the European audience. Ponce: “America After the Fall” concludes with works by Edward Hopper and Jackson Pollock. Barter: The show ends with two paintings that show the future of American art into the ‘40s and ‘50s. One is Hopper’s “Gas,” a picture of a Mobil gas station and that sort of set the tone for people like Ed Ruscha; people who went into the sort of realist end of pop art. Many people said that the Depression was the best thing that ever happened to American artists, because once they got on the federal payroll and were supported they could actually work. They had to give a certain percentage of their paintings to the government and then they could sell the rest. “America after the Fall: Painting in the 1930s” is at the Art Institute of Chicago through Sept. 18. June 30: President Obama and first lady Michelle Obama announced Thursday that the Obama Presidential Center in Chicago will be designed by renowned architects Tod Williams and Billie Tsien. June 20: Young artists get a rare opportunity to show their work. We visit the Union League Club to see an exhibition by a cultural institution in the Kenwood community called Little Black Pearl. June 16: From his studio in Bronzeville, Kerry James Marshall creates large-scale canvases that are prized in museums around the world. A 1997 winner of a MacArthur "genius" grant, Marshall spoke with “Chicago Tonight” at the opening of his career retrospective at the Museum of Contemporary Art. June 3: A pair of Midwestern artists makes richly detailed paintings that explore mythology and nightmares. Aside from mysterious themes and striking visuals, the works of painters Gina Litherland and Paul Lamantia are essentially different.